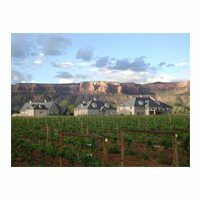 Nestled between the gateways of the Colorado National Monument is our winery and chateau. The entire project was built from the ground up on 15 acres of vacant land in 1999. Located in the Redlands area of Grand Junction, we offer wines of the noble varieties, which can be tasted and purchased in the intimate setting of our tasting room. Come enjoy an enlightening tour of the facility or pause to take in the unimaginable views. You are invited to sample our award winning wines, stay at our country inn, or convene at our conference/event center. Whatever your needs, you will discover a truly unique, but unpretentious experience. Our hours of operation are Monday-Saturday 10:30 a.m. to 6:00 p.m. and Sunday 12:00 p.m. to 5:00 p.m. Closed: New Year’s, Easter, 4th of July, Thanksgiving, & Christmas. west to 24 Road exit, 24 Road (Redlands Pkwy), south (left) to Broadway (Hwy 340). Turn right (west) on Broadway Road (Hwy 340), 2 1/4 miles. Vineyards & winery on south (left) of Broadway.